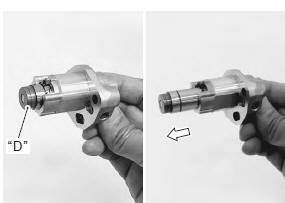 The cam chain tension adjuster is maintained to proper tension automatically. Remove the cam chain tension adjuster. Refer to “engine top side disassembly” . 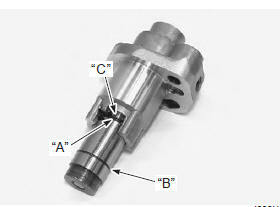 Holding the cam chain tension adjuster as shown in the figure, compress the plunger by turning the adjuster body until the outer circlip “a” reaches the groove “b”. Hook the outer circlip “a” into the groove “b”, then turn the plunger head clockwise more than 90° to make a little play in the inner thread mechanism. if it is difficult to compress the plunger because of internal engine oil, disassemble the adjuster by releasing the inner circlip “c” and spill out the oil. 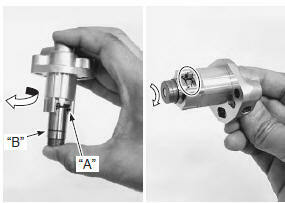 do not turn the adjuster body until the outer circlip “a” exceeds the groove “b”. If the inner circlip “c” is caught in the groove “b”, plunger may not go out automatically from the adjuster body even if pushing force is applied on the head. In such case, it needs to be disassembled. Check that the plunger goes out automatically when its head “d” is tapped. If it does not work smoothly, replace the cam chain tension adjuster with a new one. Install the cam chain tension adjuster. Refer to “engine top side assembly” .